When Craig and Amy Groeschel founded Life.Church in 1996, it looked like many church plants: forty people meeting in a two-car garage using a borrowed projector and a couple of construction lights. As of 2017, Life.Church has locations in eight states with a vibrant Church Online community reaching an estimated 235,000 unique visitors each week. Early on, Life.Church decided to wholeheartedly embrace the words of Jesus that it’s more blessed to give than receive. Rather than desiring more for Life.Church alone, they desired more for the Kingdom of God. So they’ve made all the resources they’ve created available to others for free through the Life.Church Open Network. On this site, pastors and church leaders can access children’s materials, creative resources, tools, ministry ideas, apps, trainings, and community. They decided against selling curriculum and resources and instead actively open-source everything. Generosity is contagious. and today the resources available on Open Network aren’t just from Life.Church. They’ve also partnered with other ministries with the same heart for the local church—like Hillsong, Elevation Church, and North Point Ministries—to offer their resources as well. And it’s not just large-scale organizations like Life.Church modeling this open handed posture. Jared Nelms of the Timothy Initiative has a passion for discipleship. After creating curriculum titled Disciples Making Disciples and implementing it both domestically and internationally, the Timothy Initiative realized their impact could be far greater by sharing it with other organizations. We imagine what might happen if the type of radical generosity modeled by Life.Church and the Timothy Initiative were normative. Both operate from a spirit of generosity that prioritizes the Kingdom over their own kingdoms, acknowledging that all they have has been given to them and that God is the source of their abundance. After working with many collaborative leaders around the world, we observed six common ways they became more generous leaders. We encourage you to practice these collaborative leadership principles in your life and ministry. Isolated, abandoned, and boarded-up city streets, Jacobs writes, are hotbeds of crime and neglect. The same is true for charities. It’s all too easy for us to live in our echo chambers, allowing our organizations to exist solely for ourselves. To counteract this tendency, generous leaders like Jordan Steffy let no “street” go unused. Steffy, founder and CEO of Children Deserve a Chance, open-sourced his foundation’s strategies and operational plans for the Extraordinary Give. As other nonprofits recognized their unique approach and wanted to learn from their example, Steffy generously shared their playbook with others, inviting other organizations to learn from their example and increase their support. Since greed is driven by a fixation on scarcity, focusing on God’s provision is a powerful countermeasure. In one of several such instances in the Old Testament, Joshua erects a monument after God stops the waters of the Jordan River, allowing the weary Israelites to cross into the Promised Land (Josh. 3-4). Tangible reminders of God’s provision are powerful. And they help us recall the ways God has provided “manna” in our organizational lives. Periodically at HOPE, we turn a wall in HOPE’s office into a place to list and remember the prayers we have seen answered and the mountains moved on our behalf. When we find ourselves in a place of scarcity, we find tremendous encouragement in remembering God’s abundant provision. Readily celebrate what others do well—mentioning them by name—and, when given the opportunity to draw comparisons between our organization and a “competitor,” refuse to speak ill of another organization. Elizabeth and Steve Gilroy founded Face of Justice with an open handed posture. They created the organization in 2009 in response to the overwhelming needs they found while traveling in San José, Costa Rica, specifically focused on fighting the human trafficking industry. One of the ways they practice generosity is in the way they host mission trips. Rather than exclusively introduce volunteer travelers to their work, they always introduce their guests to at least four other organizations. Their interns and staff members even go so far as to work on projects for these rival ministries. Rather than expanding as much as they could expand, they expand in ways respective of the strengths of their peer ministries in San José. Pastor Tim Keller of Redeemer Presbyterian Church is known not just for celebrating rivals but for creating them. During Redeemer’s exponential growth, Keller realized that he could best impact his community for Christ by planting other churches in his New York neighborhood. 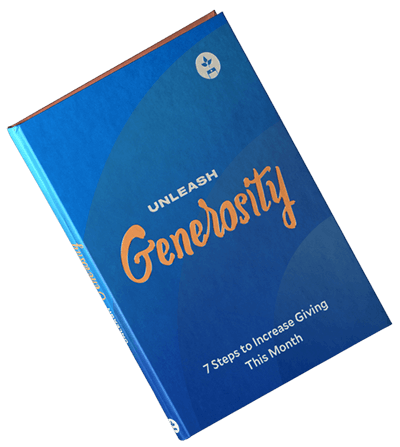 Every November, churches across the nation participate in the Be Rich campaign to partner with other nonprofits. Since its inception in 2007, the campaign has sparked a movement of outrageous generosity. Participants have donated over $29 million and have volunteered over 272,000 hours of community service in the past ten years. “It’s our way to do corporately what we’ve already been called to do individually,” says Andy Stanley, senior pastor at North Point Ministries in the Atlanta area. With an emphasis to give, serve, and love, the Be Rich campaign gives back 100 percent of the money they raise to support local nonprofits in efforts to better their communities by, among other things, alleviating homelessness, administering disaster relief, and providing clean water. What have you found to be an effective way to collaborate with others? Share your thoughts in the comments below! 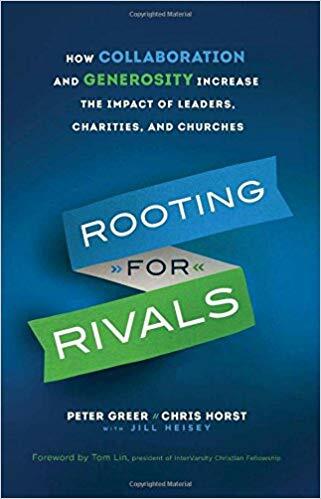 Editor’s Note: This post was adapted from Rooting for Rivals: How Collaboration and Generosity Increase the Impact of Leaders, Charities, and Churches by Peter Greer and Chris Horst. Copyright 2018. Used by permission of Bethany, a division of Baker Publishing Group.